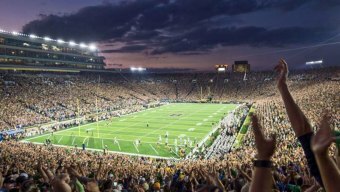 HUNTINGTON, W.Va. – Marshall University will visit the University of Notre Dame for a football game to be played on Sept. 10, 2022, Director of Athletics Mike Hamrick announced Monday. The one-game contract carries significant financial implications for the Thundering Herd, Hamrick said. "Notre Dame is one of the most prestigious programs in all of college football and a trip to South Bend, Indiana, should be on every fan's bucket list," Hamrick said. "Notre Dame is very selective when it comes to football scheduling, but Marshall's national brand, history and passionate fan base made us an appealing addition to their home schedule. "We look forward to the trip and the opportunity to showcase our football program on national television and in one of the most iconic venues college football has to offer." Big Green members and season-ticket holders will have the first chance to purchase tickets, Hamrick said. The Fighting Irish play their home games at Notre Dame Stadium, which opened in 1930 and seats 80,795. NBC and Notre Dame have a broadcast agreement that runs through the 2025 season. NBC has held the school's football TV rights since 1991. Notre Dame enters the 2019 season tied for sixth for most wins in college football history with 897. The Fighting Irish claim 11 national championships, and have the most individual Heisman Trophy winners (seven). Overall, Notre Dame has 101 consensus All-Americans and 34 unanimous All-Americans. The program has produced 52 players who became members of the College Football Hall of Fame and 13 former players were inducted into the Pro Football Hall of Fame. The number of All-Americans and Hall of Famers are all NCAA records. Notre Dame finished the 2018 season with a 12-1 record and ranked No. 5 in the final Associated Press poll. The Irish started the season 12-0 and reached the College Football Playoff before losing to eventual national champion Clemson. Marshall now has two dates set for the 2022 season. The Herd previously announced a home game against Appalachian State, which is set for Sept. 17 – one week after the trip to South Bend. Since Hamrick took over as athletic director in 2009, he has negotiated football contracts with Notre Dame, Louisville, North Carolina State, Pittsburgh, Navy, Boise State, Purdue, East Carolina, Cincinnati, Liberty, Akron, Miami (Ohio), Ohio, Kent State and Appalachian State. This past season, a one-game road trip to South Carolina was canceled because of the looming threat of a hurricane, and a road game against Virginia Tech replaced that game at the end of the season.